Every so often I am contacted by parents who hear about me through their sister-in-law, or are friends of a friend, or they know someone who knows me, and they need support in the midst of the diagnostic process… or perhaps afterward. Parents are looking for direction and often some reassurance. It can seem overwhelming and – well – it is overwhelming! I am certainly not qualified to make a diagnosis, however, I do understand the process from a parent’s point of view. I sometimes have the opportunity to reinforce the message that a diagnosis is in many ways deficit based and that for a while, from a clinical point of view, parents may have to take account of the things about their child that are not developing typically. I think this goes against what parents naturally want to focus on and notice about their child. In addition to long wait-lists for testing, uncertain paths, and at times seemingly insurmountable obstacles… it is stressful and emotionally draining to be constantly doing some sort of mental inventory of the ways in which your child is not typical. I remember telling myself – this is not all I see of my child – but this is what I have to do in order to get H the supports he needs. 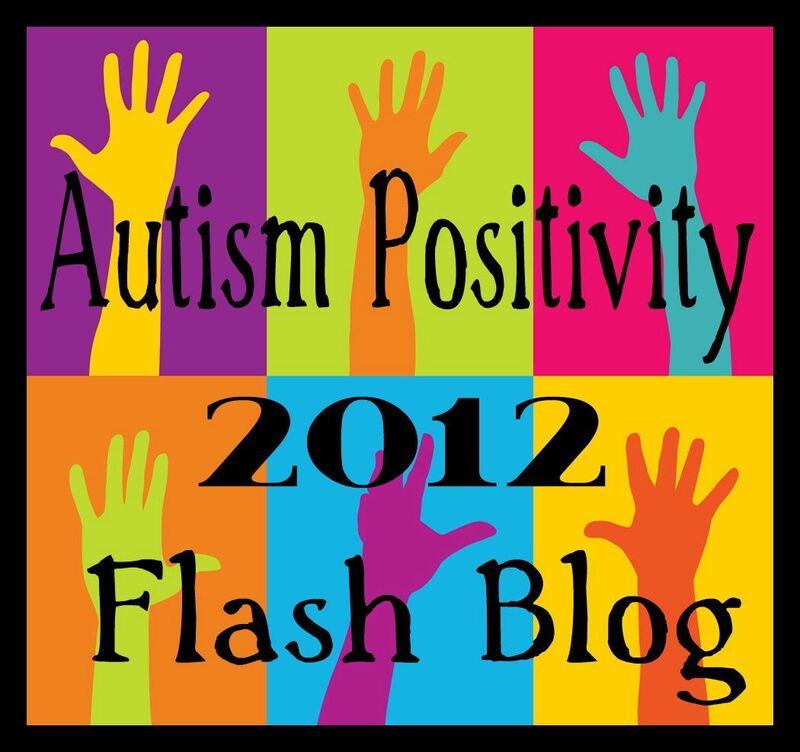 For us, the label of autism did not mean a limit, or a lid that would be placed upon our child. Instead it was an entry word into understanding his experience and a path to provide him the additional services to support his development. The referral was a very difficult thing to pursue. It still is. Some days are easier than others: some are no sweat – some are torment. But information and assessment are just that. It is a bit to get your head around – a diagnosis doesn’t make something a reality. It already is what it is. H is who he is regardless of what anyone can diagnose… the difference of course is the more info -> the more support for both H… and for us as parents. And yet… in spite of all of the above being true… deep down… rarely spoken… is the fear that a diagnosis will confirm what I suspect. I believe my child has autism. Our GP agreed with our concerns and thought that a referral to Children’s was in order. Relief – success – fear – anticipation – terror – all at once! It is not an easy thing to deal with the possibilities – the uncertainty is exhausting. It is stressful, and yet… Craig and I agree – it’s not about us – not about our level of comfort. It is about H and his needs – and our responsibility as his parents is to advocate for him. When I look back at this so many years later, I can see in myself the same thing I notice in other parents. There is such an incongruency in the mix of emotions, and the contradictory nature of these is completely understandable yet difficult to experience. It is important to understand that all of these feelings exist and are valid and that it does not represent an emotional or parental shortcoming to be experiencing them. It can feel like you are coming undone – you can be reeling, unable to focus, and dealing with family members who are sharing a similar mix of emotions. So I guess, really – that is the focus for this post. Whether you are a part of the support system to a family who is in the midst of the diagnostic process, or beginning down that path yourself with your own child. It is critical to help parents see the positive aspects of their child during a time, when through necessity, they are focused on the things that are not developing typically. I still struggle with this at times, and that too is understandable. Ultimately though, and this is almost 8 years afterward, we are most successful with our guy when we are able to focus on the strengths that H brings to the table. This entry was posted in Aspergers, Autism, Diagnosis, label, Parent and tagged assessment, Autism, Autism is an entry word..., clinical, conflicting emotions, deficit based, diagnosis, journal entry, parents, relationship, strength based, typical development, wait lists. Bookmark the permalink. As a parent of a child with autism and a teacher I have also seen this. 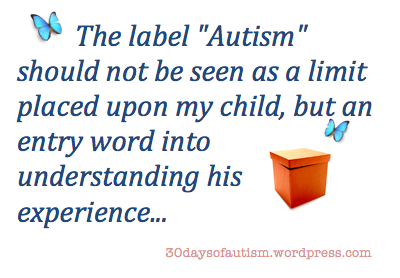 One parent expressed to me that she would prefer her son was misunderstood as ‘naughty’ than labelled autistic. Didn’t understand it then.. don’t understand it now. I am the first one to offer to speak to the other children in my son’s class (without his presence of course) to give not only the teacher but his peers a better understanding of what autism is. I think fear motivates the need to not label children with a diagnosis. But really the label is the key to understanding and support.